Williams System11 and DataEast Pinball Repair/Restoration. The two minute teaser video for Windows-based computer with Windows Media Player. If you have a non-Windows machine, there is also a MPG version available that should work on any computer (much larger in size, but higher quality too). The popularity of 1980s and 1990s pin games has really skyrocketed, so Norm and the Shagster felt it was time to do a video about restoring these great games. 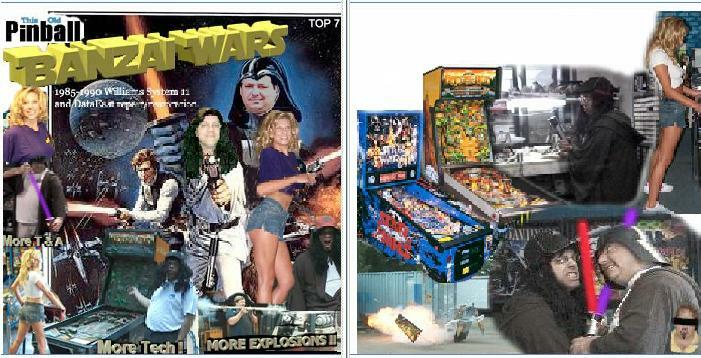 Covered is repair and restoraton of Williams/Bally System 11 (1985 to 1990) and DataEast (1987 to 1995) pinball games. Though much of this information could certainly be applied to other brands and eras of pin games. Covers complete repair and ground-up restoration of this era of pinball games. Note TOP7 has some language and content that is not intented for kids, but a "PG" kid-friendly version is also available (please specify). DISCONTINUED. (We sold like five of the PG version in a year.) The TOP7 does have some candid sexual skits with their "Bud Lite" girl named "Candy" and some rough language (i.e. an occassional "s*it"). Video is hosted by Norm and Shaggy. Two hours and twenty minutes long, NTSC video format, DVD media. The following is a list of the DVD chapter titles. This does not encompass all the information in the video, just where the chapters are marked.